Alekos is in a relationship with Voula for some time but is not deciding to marry her before his sister gets married first. In the meantime, her brother threatens to assassinate Alekos unless he proceeds in setting the date to marry Voula. Thanasis although he is a simple waiter makes all the easements to operate a tavern. As he prepares for his marriage with the sister of the tavern owners, suffers amnesia and begins wander in Athens. Before he finally walks down the aisle with his long-term fiancée and future wife, a bank employee must first give his three sisters away in marriage, even though his elder sister seems unwilling to cooperate. Is she hiding something? A lost wallet that finds one evening an honest accountant becomes the occasion to reveal a wide abuse. A ripe and frivolous philanderer has no problem in falling for a debonair twenty-year-old seductress, even though he is engaged for too long to his secretary. Will she set aside her pride to rescue the flawed love of her life? With six sisters on the verge of marriage, a desperate spinster aunt, and an entire block of flats depending on him, an indefatigable concierge is making plans for the future; however, he must first find suitable husbands for his siblings. Thodorakis is a womanizer who lies to his wife about having a friend who lives in Patra in order to cover his dirty business. What happens when this fake friend appears in front of him and the night before he is ready to go with his mistress? A sharp altercation will pave the way for a brilliant career when a shameless liar meets his future employer: a resourceful parliamentarian. But, what happens when he tells one lie too many? Is his flair for fiction always beneficial? Successful thanks to the monthly cheques of his young wife's uncle, a parsimonious contractor will find himself in a fine mess when an affluent and suave suitor intends on marrying his spouse. Is he willing to change to keep her? Vengos studies in a secret agents' academy, dreaming of becoming a great spy like 007. Unfortunately, he can't do anything right, so he wreaks havoc during his final exams. Thanasis Vengos plays a poor young man that comes to Athens looking for a job. We watch as he tries many different jobs; druggist, photographer, even wrestling referee. The result is always hilarious and explosive! Poor Rena tries to find money to pay her lottery partner because she destroyed the wining lottery-ticket, but, she and her brothers who try to help her, end up in a harem. 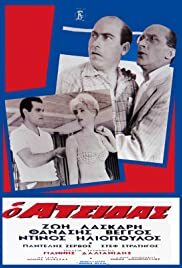 A rich girl causes problems in a traditional, folk neighborhood of Athens when she opens a shop that plays modern music. A very funny, and at the same time bitingly satiric, view of Greece, Greeks and their morals. It has some extremely funny moments, e.g. the initial encounter between Iliopoulos and Vegos as well as the initial encounter between the Stratigos and Iliopoulos. Almost every frame is both funny and commenting on social mores. I would highly recommend it.